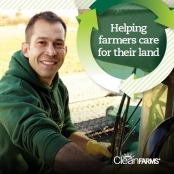 April 20, 2015, Etobicoke, ON - Canada's leading agricultural stewardship organization, CleanFARMS is calling all Ontario farmers to take The Great Ontario Clean Farms Challenge and help profile the positive contributions they make to the environment through good waste management. "Farmers are committed to acting in environmentally responsible ways," said Barry Friesen, general manager of CleanFARMS. "This challenge encourages farmers to share what they do and allows us to showcase their ongoing stewardship commitment." The Great Ontario Clean Farms Challenge launches this week and is open to all farmers who own or operate commercial farms in Ontario. The challenge closes on July 30, 2015. Finalists will be selected based on their commitment to best practices, innovation, and participation in recycling programs. The winning farmer will receive a $5,000 cash prize. This is the second Clean Farms Challenge. The challenge, which ran last year for the first time in Manitoba, is designed to help create a dialogue about the on-farm innovations that help farmers reduce, reuse and recycle agricultural waste. CleanFARMS Inc. is a not-for-profit industry stewardship organization committed to environmental responsibility through the proper management of agricultural waste and is best known for its award winning empty container recycling program. CleanFARMS works with a variety of stakeholders to deliver end of life stewardship programs to farmers.